Tomorrow evening, Thursday, Alash will be performing from 6 to 8 pm in the courtyard at Princeton Shopping Center, 301 North Harrison Street in Princeton Township. Alash is an ensemble of master throat singers from Tuva, a tiny republic in the heart of Central Asia. Tuvan throat singing is one of the world's oldest forms of music, in which a singer can produce multiple notes simultaneously and sustain them for long periods of time. The ancient tradition of throat singing was developed among the nomadic herdsmen of this region, who had a close spiritual relationship with the natural world. The sounds produced may mimic those in nature — birdsong, whistling wind, a bubbling stream or a trotting horse. 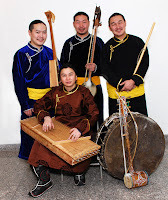 Alash, named for the river that runs through their home region, are masters of Tuvan throat singing and of traditional Tuvan instruments as well. Alash is inspired by the music of their grandparents and the great Tuvan and Central Asian musicians, but they are also influenced by jazz and rock, infusing modern influences into their traditional music. Alash has collaborated with diverse groups from the innovative jazz ensemble Sun Ra Arkestra to the classical Chamber Music Society of Lincoln Center. Alash appeared as guests artists on a Grammy-winning CD by Bela Fleck and the Flecktones. Yet Alash remains committed to their own ancestral heritage, winning multiple awards internationally for traditional throat singing, both as an ensemble and as individual musicians. The Washington Post described their music as "utterly stunning," remarking that after the performance "audience members picked their jaws up off the floor." This performance is one of the Summer Courtyard Concerts at Princeton Shopping Center presented by the Arts Council of Princeton and sponsored by the Princeton Shopping Center Tenant Association. Concerts will be held Thursday nights until August 27. Don't forget to bring a lawn chair. Admission is free to these events.